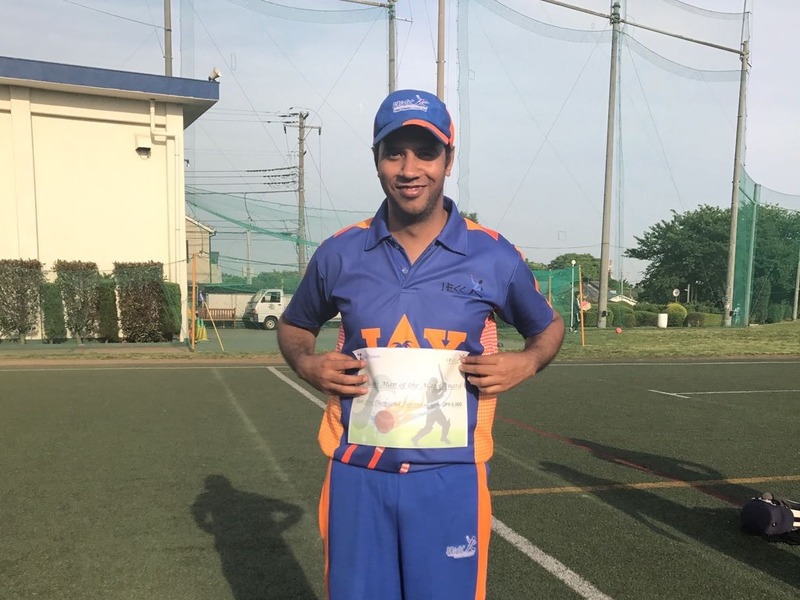 Over the past few years, the Indian Engineers and Shizuoka Kytes have competed in some thrilling encounters and the Pacific Friendship Cup final was no exception with the two teams playing out a match for the ages. In a memorable final, the Engineers chased down a stiff target of 197 off 30 overs with 8 balls and 1 wicket to spare to win the PFC for the third time in 4 years. What made the match memorable was not only the high scoring and an utterly nail-biting finish, but the attitude and enthusiasm displayed by both the teams to battle it out in almost unplayable conditions. Probably unplayable is not the right word, because the conditions were ideal for a game of ice hockey or some winter sport, except for the lack of ice! But the lack of ice was more than made up by an incessant, chilly drizzle. The suspense for the day began well before the match. With the weather forecast predicting heavier rains, whether the game was on or not couldn’t be known until 6:30 am, by which time the Kytes, being the hosts were supposed to inform Biju. I’m sure that between 6:00 and 6:30 am, Dec 4th 2005, Biju Paul must’ve been the busiest guy on Earth(pun intended), apart from the sellers in Tsukiji fish market! 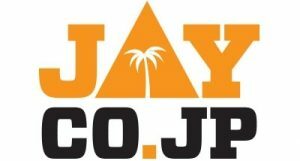 What with the whole team wanting to make the torture trip to Shizuoka! But as it turned out, the trip ended up being most enjoyable and satisfying. So, the Engineers arrived at the ground well before the scheduled start of play. Thanks to Bobby Philips, our F-1 driver, driving the team in his Toyota like Schumacher! Probably he just drove with the freedom he wouldn’t have had if his Dad had made the trip, or maybe he just couldn’t wait to get his hands on the Pacific Cup (cup? what cup?? no cup!). Bikash steered in the rest of the team and we were all set to play. Biju set the team in the right mood by giving away some goodies, courtesy of our sponsors, HumTum TV. Also, the Kytes had a nice fire started and after a brief warm-up (next to the fire!) it was time to get on with the main course. Vimal Vikrant, captain of the day and third in line of the Engineers’ captaincy hierarchy, promptly lost the toss and elected to field! We took to the field with most of us in attires fit to scale the nearby Mt.Fuji and Bikash looking atleast twice his size. Vimal decided to open the bowling himself along with Rahul. Vimal went for runs Rahul bowled with control and discipline. Newcomer Sangan Kalgi replaced the captain and brought immediate rewards when he had Neil Harrison caught behind. Rahul and Sangan then continued the stingy line and length. Rahul in particular was very impressive with his control and got due rewards. He nailed Shoaib and Nick, number 3 and 4 in the Kytes order, with a couple of superb deliveries, both going through the defenses and sending the stumps for a walk. At that time, with the Kytes 3 down for 29, it was beginning to look like a stroll in the park on a sunny Sunday afternoon for the Engineers. To be noted here is that the ground condition was beginning to deteriorate rapidly. The constant drizzle making the run-up and the follow-through on to the pitch quite dangerous. In walked Robb, the Kytes’ captain, and began to steady the innings. With the opening bowlers being saved for the death overs, a brief partnership followed. Sangan proved to be a difficult customer to negotiate with his left-arm seamers slanting away at good pace. Bobby replaced Rahul and started off quite well. But the Kytes were batting more freely and were chancing their arms and their score card began to look more respectable. Vimal switched over to bowling his off-breaks, and was immediately rewarded with the wicket of Lalith, the score reading 4 for 60. It still looked good for the Engineers, except that the Kytes had cleverly saved some of their best batsmen for the last! Vimal let everyone have a go at the ball and the Kytes began to capitalise on it. In all, 9 bowlers were tried out, and except for a couple of them, all went for runs. Since there were quite a few new-comers, at least it made everybody feel like they were actively involved in the game instead of being just left to field at third-man or deep fine leg which can sometimes be quite dispiriting. Well done Vimal. So, with this rotation policy, the Kytes made merry. Arbab had just come in, and along with Robb, went about clobbering the bowling. Things weren’t looking too good for the Engineers and Biju was requesting for a fire-break after almost every other over! Can’t blame him though. In between all this, an important incident occurred. The ground had become very slippery and the new comer Mithun came on to bowl his off-spinners. Here was a bowler who has a classical off-spinner’s action and flight, but couldn’t quite get it right as he was slipping in his run-up. In fact, he injured his arm quite seriously during one of his falls. When Prashanth replaced him, the very first ball he bowls and is flat on the ground! That was a bad fall, and the captains began discussing about the conditions. Prashanth was suggested to bowl without stepping onto the mat. C’mon guys, it’s a Cup Final and not some friendly match! But dutifully, he bowled the next ball from well behind the umpire. Getting some confidence from this, the third ball he just steps onto the mat and promptly slips and goes sprawling. Now this was serious and it was obvious that play couldn’t continue under the circumstances. Both the teams got together and discussed various options, such as playing without the mat, playing with a tennis ball, etc! Just when the captains were deciding to call off play and reschedule the match, Jude Joseph came up with a brilliant brainwave. He suggested that half the mat be removed and bowling only from the end without the mat. The grass wasn’t so slippery though. It was only the mat which was the culprit. So it was decided to implement this idea, and things began to work out fine after that. During this stoppage however, there was another incredible moment! Sangan, who had bowled a good spell earlier on, decided to see for himself what the fuss was all about. So, he measured his runup, without ball in hand, mind you, runs into bowl and what followed was one of the most spectacular falls seen on a cricket field(Bobby’s fall still remains right up there on top, though!). Some of us, who were discussing various options, caught a glimpse of the fall(jut like Bobby’s fall was caught by only two guys), almost in slow motion, and were wondering just what he was up to! As amusing as it may have looked, it was a wicked fall and he hurt his back badly which made fielding and batting quite painful for him. Nevertheless, he took a fine catch later and played an important innings as you will learn later on. Anyway, after Jude had saved the day for both teams, play resumed after the long stoppage. 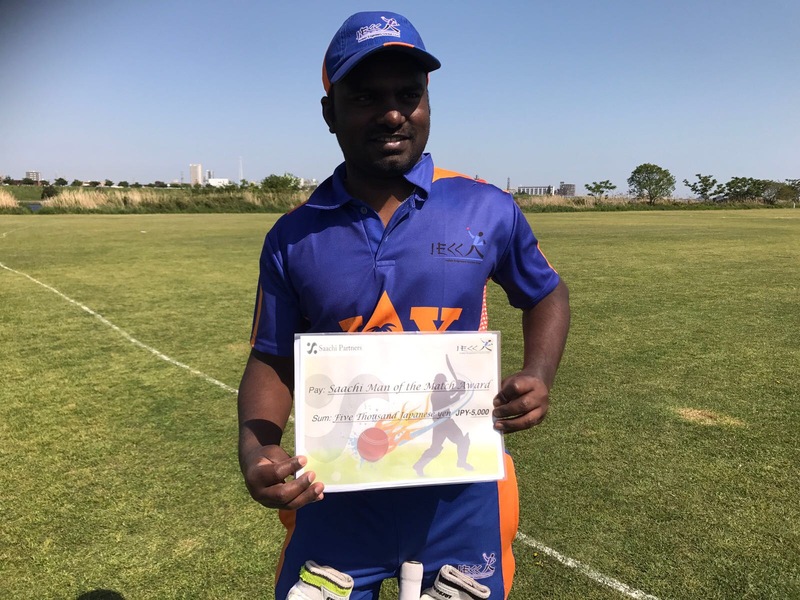 When Vimal came on for his second spell, Robb, who was batting beautifully on 63 lofted one straight to deep midwicket where Bobby took a fantastic catch. Though it was a straight forward catch, considering the cold and the freezing hands, it was a great effort, and an important one. In walked Sharpe, and with Arbab pulling and hitting across almost everything, the Kytes’ score was looking ominous. Sharpe was in brilliant form and was hitting the ball with brutal power from word go. 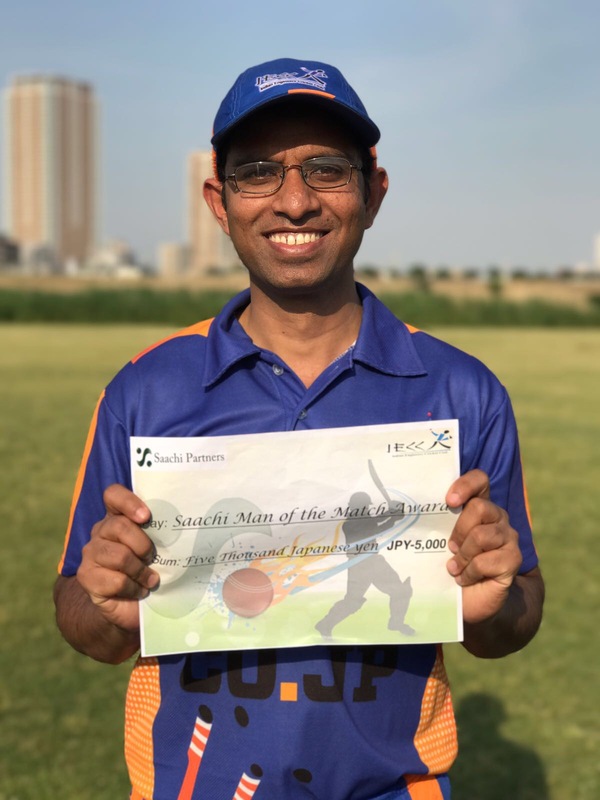 Biju, a reluctant bowler after a long lay off due to his shoulder injury, was given the ball, and he responded in fine style with his shortened runup and aSharmaji-like left arm action(or rather no action). He had the hard-hitting Arbab caught in the deep cover point, for a well made 33, again stunning running catch by Bobby. In the 3rd ball of his next over Biju clean bowled Wooler, taking advantage of the batsmen’s poor footwork and was on a hat trick as he clean bowled the next batsman next ball. Though he missed out on the hattrick, he ended up with 3 for 24, a great spell indeed for a comeback bowler. His kangaroo-style jumping celebration after each wicket showed sheer joy and was quite a sight to watch. With the last man in and overs running out, Sharpe went into over-drive and Biju suffered the most. Almost every ball was dismissed from his presence with utter disdain. One such hit almost took Biju’s arm along with it to the straight boundary! To Biju’s credit though, he didn’t show the obvious pain:-) Rahul, the best bowler on view, came on and was dispatched through mid-wicket for a couple of fours. Vimal moved extra-cover to plug the gap at deep mid-wicket, and Sharpe trying to capitalise on this, made room and tried to hit through covers only to find the stumps rearranged. He made 37. It was a good move by Vimal and an important one. The Kytes’ innings folded up for 196 with 9 balls still to go, and as it turned out, the runs that could’ve been scored in those 9 balls could have made the difference between winning and losing. For the Engineers, Rahul, Vimal and Biju picked up 3 wickets each and Sangan chipped in with one. Rahul was by far the best bowler, bowling wicket to wicket and giving no room to the batsmen. Sangan too impressed. Biju, though suffered at the hands of Sharpe, was quite effective. The remaining bowlers sprayed the ball around and as many as 40 to 50 extras were given away! Staggering by any standards. Anyways, the fielders were really glad to get to the fire. There was super hot cup noodles awaiting the cold and hungry players, courtesy the Kytes, who were really quite magnanimous as hosts. Set to score 197 off 30 overs, the Engineers had fire in their belly, literally, after consuming the hot noodles and the best part of the match was set to happen! A required rate of close to 7 per over is quite a challenge by any means, and especially against the Kytes’ new ball attack. You cannot afford to just see off the opening bowlers without scoring too many, because by then the asking rate would have rocketed up. So, with no particular game plan, except to play their natural game, the Engineers set off on their chase, with Vimal and Prashanth. The Sun too had just come out a little bit, perhaps to get a glimpse of the intense action that was to follow! The Kytes’ opening bowlers, Sharpe and the left-handed Tomlison started off with some ferocious pace and control. There was a flicked four through midwicket off Sharpe’s first over by Prashanth and Vimal too saw off a probing opening over by Tom. So, in the first two overs there was little indication of the impending drama. Into his second over, Sharpe was beginning to be almost unplayable with his late inswinging toe-crushers. His first such ball accounted for Vimal. A full length delivery swinging in late had Vimal falling over as the ball crashed into the stumps. It was a beautiful ball and there’s almost nothing a bastman could do, except be lucky to dig it out, but then at that pace it’s a tough ask. Jude Joseph came in at No.3 and played the first few balls confidently enough. But then in Sharpe’s next over, he received another unplayable one. Full, fast and furious that caught the batsman plumb in front. Despite all this havoc, Prashanth was in quite splendid form. He cut, drove and flicked with abandon. Standing well outside the crease, he played late to counter the late swing but also quickly latched onto anything short. There was a classic cut past point, a drive through covers and a couple of flicks past midwicket. There were also a couple of drives over the bowler’s head hit with savage power. Bobby who had come in at the fall of Jude was intent on seeing the opening pair off and was doing that quite well. He showed good judgement of where his off stump was and was content in leaving balls that didn’t require to be played at. Apparently, he didn’t know where his middle stump was and by the time he realised where it was, it had gone for a ride by Sharpe’s inswinger. At 3 down for 36 only in the sixth over, the Engineers were staring down the barrel and the Kytes were flying high. Something special was required to get them to 197. A partnership was necessary and that came in the form of Rahul and Prashanth. Rahul was keen that his earlier bowling exploits not going to waste and batted sensibly letting Prashanth do the scoring. The Kytes were all fired up and wanted to finish off the Engineers when they were down. So their opening and most potent bowlers bowled their quota of 6 overs each at a stretch hoping to get a few more wickets. That was a huge gamble taken by the Kytes and it didn’t pay off as Prashanth and Rahul had other ideas. Constantly talking to and motivating each other, they not only made sure that no more wickets fell to the opening duo but also scored at the required rate with some excellent running between wickets. It also helped that the new ball bowlers had finished their spells and the first change bowlers were on. So the Engineers at the half way stage were around 100 for 3 and went into the fire-break reasonably confident. Immediately after the break though, Rahul fell – stumped by Robb, standing up for Tom, for a well made 13 after putting up a partnership of 64 in just 8 overs which brought the Engineers back into the match. Bikash came, saw and left without conquering:-) again the result of yet another stumping. Sangan, who bats left-handed, came in with Jude as his runner, and started middling the ball confidently. The slow bowlers were in operation now and the batsmen were content in just working the ball around. After a brief partnership, the Engineers suffered another setback when Prashanth, who was looking set for a big one, fell trying to work the ball to square and missed a straight one from Nick to be plumb in front. It was a good innings with shots all round the wicket and spared no bowler in his breezy 50 ball 66(8×4). But he left with the job half-done. The score read 144 for 6 in the 20th over. 53 were required off the last 10 overs and the match was delicately poised. But one final act from the Engineers was to follow in a match which saw the advantage shift from one team to the other every 5 overs. Yogesh joined Sangan and they proceeded to build the most important partnership of the match. Without being overly cautious, they took their team closer to the target with good running and some timely boundaries which ensured that the asking rate was always comfortable. Jude, running for Sangan, was just terrific. Just when it looked like they would take the team home safely, the match took another turn with the fall of Yogesh for a responsible 22(4×4) off only 13 balls, another brilliant glove work by Robb behind the stumps. They had put on 38 for the 7th wicket off just 5 overs. Sangan followed soon for 22(4×4), falling victim to Arbab. Robb’s superb glove-work needs a mention here. Yogesh fell to a brilliant stumping off a spinner. With the slow bowlers operating, Rob was a constant threat behind the wickets. With the pitch slippery and the batsmen regularly missing their footing, the danger of being caught out of the crease was constant. The batsmen realizing this had to play the spinners from well within the crease as any kind of footwork was hazardous. But still Robb would end up with 4 such blinding fast stumping which was mainly responsible for the Kytes remaining in the match after their inital strikes. So, with the fall of Sangan, the 7th wicket, Biju joined Sangan and they took the score tantalisingly close before both fell in quick succession, with Sangan at 186 and Biju at 191 being the 9th wicket. Sangan’s 22 and though Biju scored only in the single digits, their runs were worth the weight in gold. By now, every run was being wildly cheered and every batsman was welcomed back to the fire-place to a hero’s welcome. Voices had gone hoarse with screaming and cheering and I’m sure that more than one of the Engineers’ hearts skipped beats on more than one occasion! This was definitely not a match for the weak-hearted. 6 to get with 1 wicket and 12 balls left. Mithun, who was hardly able to lift the bat due to injury, had joined Biju and had struck a couple of nicely timed on drives for some valuable 2’s. Biju then gave a brief hope of seeing the Engineers through when he hit a four through the small gap of a decade but fell victim to yet another brilliant stumping off a wide ball. At 191, the last batsman Yousuf walked in with his slippers on! You see, he wasn’t expecting to play and had only made the trip to cheer us. So, considering the slippery conditions, all started to check for the right size shoes for Yousuf. Finally Yousuf settled for Bobby’s Nikes, a very fine choice indeed! The Jason Gillespie look alike Mark had been operating in the death overs. Similar hair style, similar run-up and action but not the same pace, good control nevertheless. The situation at this point was: Runs required: 6 Tension: mounting Mithun: takes a couple and another single Runs required: 3 Possible result: Any of the three Tension: mounting On strike: Yousuf Wickets left: 1 What happened: Calmly pats out the first ball What happened next: Gets beaten second ball Runs required: 3 Tension: mounting What happened: Third ball, slightly short outside off and he calmly lofts it to the cover fence for four! The Engineers had done it. A remarkable run chase. As everybody runs on to the field. Yousuf’s lofted in the air (and caught!). Celebrations, hugs and victory shouts all around. The two teams congratulated each other. The Kytes have taken the defeat very well. No complaints or bitterness or long faces. Just a calm acceptance of the ways of sport and God! The camaraderie between the teams was great. Though the match was fiercely competitive with both teams fighting every inch and even occasionally sledging, everything was done in good spirit. Even umpiring decisions were accepted graciously, but this was also due to the fact the umpiring from both teams was very fair and top-class. It was pretty dark by now. The great, life-saving fire was put off and the teams decided to carry on the good spirit to the nearby Soba restaurant, which is the Kytes’ den and favourite watering hole. Over a few beers and colas, everyone was supposed to nominate their best performer and highlight of the match. It wasn’t serious stuff though, with people nominating Sangan’s fall, Gillespie looks, Robert’s colourful scorebook, Yousuf’s commitment for playing in slippers, Sharpe’s appealing, Jude’s half-pitch idea, and so on. It was almost a perfect end to a wonderful cricketing day. And on the long haul back to Tokyo, everyone felt safer with Biju doing the chauffeur’s duty this time:-) Bobby, just kidding. To wrap up this already long report, it was a complete team effort. Good all round performance: Rahul and Sangan Standout bowling : Rahul, Sangan and Biju Fielding : Bikash(good keeping to some bad bowling! ),Bobby(2 great catches), Mithun and Jude Batting : Prashanth, Yogesh, Sangan and Yousuf Spirit and enthusiasm : Kytes and Engineers Scope for improvement : Around 40 extras!!! Tons of thanks to : Kytes Above all, great captaincy by Vimal. Good rotation of bowlers, field placements and got the batting order dead right.